Wealthsimple is a roboadvisor. This is an automated investing tool for people who want to get into the stock market but aren’t sure where to start. Wealthsimple has been on the scene for a few years, but I only just signed up last month. I’ve been getting hundreds of requests for a Wealthsimple review so I finally signed up to see what all the fuss is about. I waited too long! 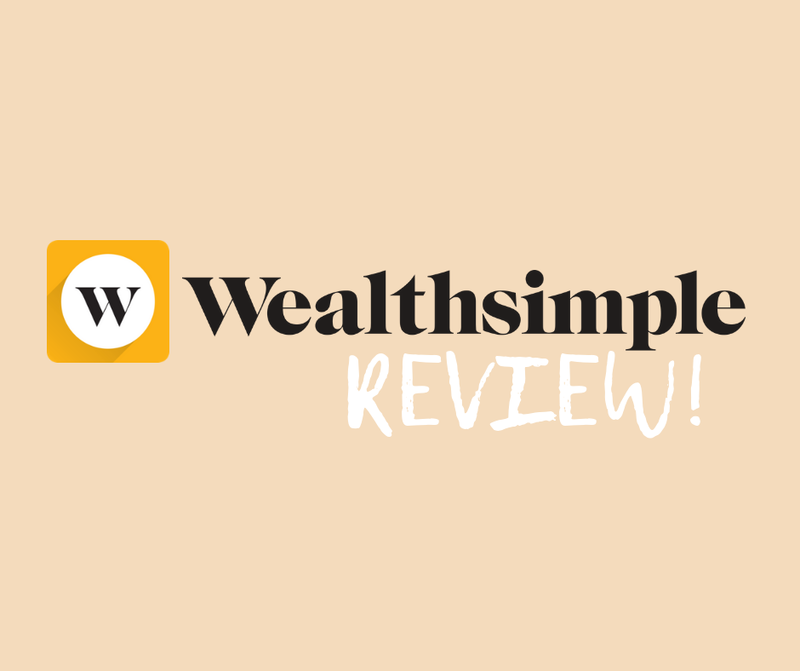 In this Wealthsimple review I share what’s to love (and some things not to like) about this popular roboadvisor. Many people have questions about Wealthsimple because roboadvisors are still fairly new. It’s easy to be wary of investing with a brand you’ve never heard of before, rather than The Big 5 Banks we’re all familiar with. But if you don’t take advantage of the new fintech that’s coming to market, you’re missing out on some pretty great tools to manage your money. I want to reassure you that Wealthsimple is legitimate and they’re pretty great! They might even be exactly what you’re looking for to build your portfolio. In this Wealthsimple review, I share all the perks and downsides of this online roboadvisor. If you sign up here, and open an account with at least $100, your first $10,000 invested with Wealthsimple will be managed for free. That’s right, free. Hate fees? You don’t have to pay them on your first $10K! Wealthsimple has super low fees to begin with, but nothing beats $0. The best feature of Wealthsimple is hassle-free investing. Everyone should invest in the stock market, but learning how to do so safely and profitably takes a major investment in financial literacy. You have to learn all about the stock market and make calculated decisions about where to put your money. Once it’s in there, you then have to worry about re-allocating your investments and taxes. Sounds complicated? It is. But Wealthsimple will do it all for you. Wealthsimple is a robo-advisor. This doesn’t mean your money is managed by a robot, but it does mean that it’s managed automatically. There is a real live person making the investment decisions behind the scenes, but they’ll be investing your cash based on your investor profile and financial goals. All you need to do is transfer funds to your Wealthsimple account, and they’ll take care of the rest. If you do want to talk to a real live person, you can. The Wealthsimple financial advisors are there to answer questions and help you plan your financial future every step of the way. Wealthsimple charges 0.5% in fees to manage your portfolio, which is a fraction of that charged by most financial advisors and traditional mutual funds. As mentioned above, you can get this fee waived on your first $10,000 invested by using my link. If you don’t know anything about investing beyond that you absolutely should be doing it, Wealthsimple is perfect for you. If you’re a self-directed investor but want to diversify and have someone else take the reigns on part of your cash, Wealthsimple is perfect for you, too. I think robo-advisors can have a place in everyone’s portfolio! One of the great things about Wealthsimple is they offer registered accounts. This means you can invest through the Tax-Free Savings Account (TFSA), Registered Retirement Savings Plan (RRSP), or Registered Education Savings Plan (RESP). The best way to maximize the power of these tax-sheltered accounts is to use them to invest in the stock market. Wealthsimple lets you do that. DO NOT waste the power of your TFSA or your baby’s RESP in a simple savings account. Invest in the stock market so you really benefit from the tax-sheltering power of registered accounts. Wealthsimple will let you have multiple accounts, so it’s fine if you want to set up any combination of TFSA, RRSP, RESP, and unregistered accounts. One major perk they offer is called Wealthsimple Black. Not only does this offer a low fee of 0.4% on your funds, it also provides other perks like VIP access to airport lounges and one-on-one financial coaching. You need to have $100,000 invested in order to qualify for Wealthsimple Black, but that’s $100,000 total across all accounts. This means you could have $65,000 in an RRSP, $30,000 in a TFSA, and $5,000 in your baby’s RESP, and even though there’s less than $100K in each, the total adds up to over that threshold so you can get all the perks! I found transferring my first $100 deposit to Wealthsimple super fast, so my portfolio got started right away. As soon as the funds appeared in my account, I could see the balance change by a few pennies on different days as the stock market went up and down. This is a great way to dip your toes into the stock market and start to get a feel for watching your money go up and down with market fluctuations. Wealthsimple’s advice — which is also mine to investors everywhere — is to set it and forget it. You need to take a long-term perspective with your investments and not worry about day to day fluctuations. Time is on your side! You will earn dividends from your investments in Wealthsimple, and they’ll be reinvested in your portfolio. This again is one of the great hands-off features of a robo-advisor. You don’t have to do anything except watch your balance grow! Even more good stuff about Wealthsimple! No Wealthsimple review is complete without talking about the app itself. The Wealthsimple platform is simple and beautiful. It lets you know how your cash is doing, and what it will grow to overtime with regular contributions. The app is equally stylish and easy to navigate, so you can check your accounts on the go. I personally love that they include their news and stories directly in the app. The Wealthsimple Money Diaries have been one of my favorite financial series of all time. I can’t get enough of peeking into how other people manage their money. Wealthsimple also offers high-interest savings accounts, so you can save AND invest. 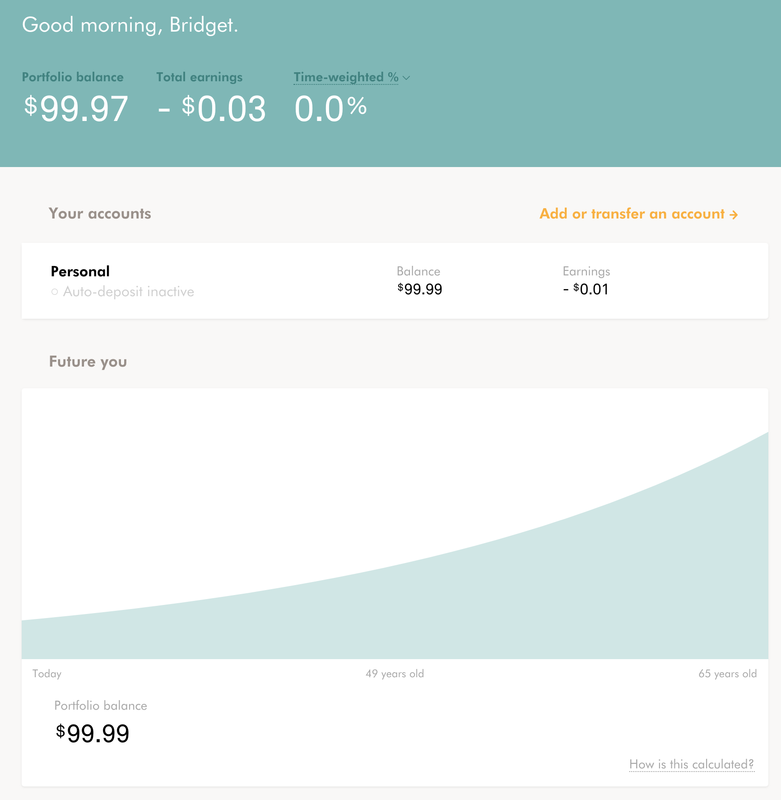 Wealthsimple’s Smart Savings Account currently has an interest rate of 1.95%, which is higher than those I’ve seen offered by banks. This makes Wealthsimple a great place to invest AND save for your financial goals. If you’ve been kicking yourself to get your finances on track, Wealthsimple is 100% the way to do it on autopilot. You can rest easy knowing your financial future is taken care of. Take back any time you’ve spent worrying about money and go back to enjoying your life! This wouldn’t be an honest Wealthsimple review if I didn’t mention some of the drawbacks of the platform. The main downside of Wealthsimple is tied to its main upside: it’s all automated. This means there’s little investor control over what happens to your money after you deposit into your account. For most people, this is exactly what they want. For others like myself who have made every single investment decision since they got into the stock market, giving up the reigns to someone else can be a little bit anxiety-inducing. 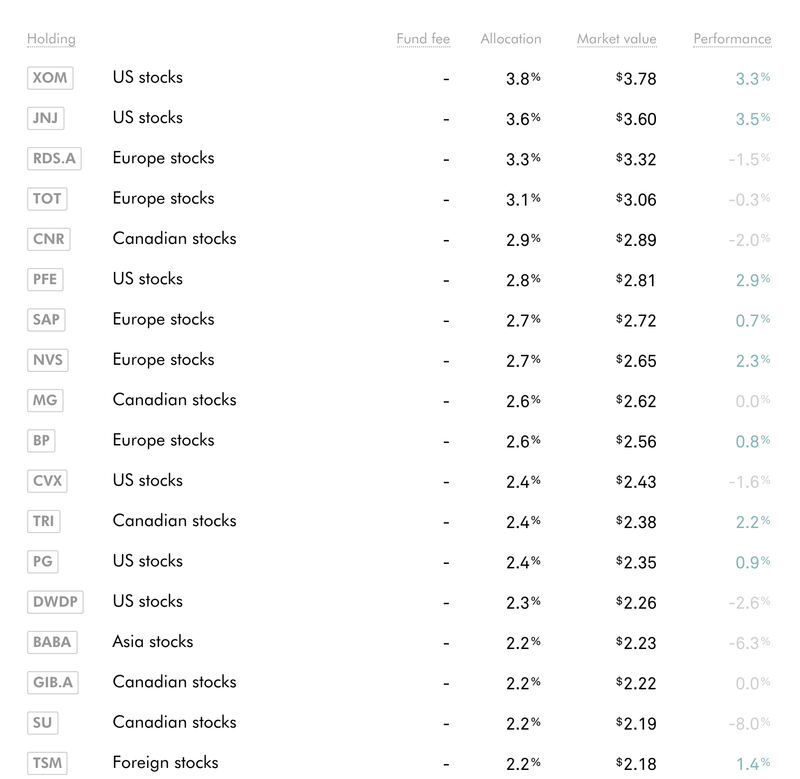 When I deposited my first $100 into Wealthsimple and they told me what stocks they were investing my money into, I cringed at a few tickers because they were not what I would have chosen for my own portfolio. This doesn’t mean they’re bad investments! It simply means they’re not what I would have picked, or they were not the allocations I would have chosen. Wealthsimple does offer an option to choose socially responsible investing. This can take the edge off of putting cash into companies that have questionable practices. However, when I clicked this option, I didn’t see the list change significantly, and I still saw quite a few tickers of businesses I personally wouldn’t classify as ethical investments. This brings me to a minor issue I didn’t like about Wealthsimple. When it showed me how my money was invested, it listed individual stock tickers. Next to them it simply said “Canadian Stocks” or “Europe Stocks”. I recognized what tickers belong to what company because I’ve been staring at the stock market daily for 10 years. But someone who doesn’t make a point of checking the market might not know what these are. If you have to sit down and match every ticker to a company to know exactly where your money is, it kind of takes the “no-hassle” part out of no-hassle investing. Nevertheless, this is a minor issue with my otherwise positive Wealthsimple review. In conclusion, Wealthsimple is an awesome low-fee robo-advisor that is perfect for investing in the stock market without any headache. Whether you’re saving for retirement, your child’s future, or just to grow your net worth, Wealthsimple is the perfect place for your money. I hope you enjoyed this Wealthsimple review. And I hope you enjoy Wealthsimple as much as I do! Leave a comment below letting me know what you’re investing for, and if there are any other financial reviews you’d like me to do next! Can you please review EQ bank? I’ve been using Wealthsimple Since March of 2018 and I’m obsessed. I changed jobs and had to figure out where to transfer my RRSP account and decided it was the perfect time to give it a try and so happy I did! I’ve already noticed larger returns than I saw when my RRSP was with my previous employer’s provider. Hi Bridget, if you click on the tickers, a brief description of each one appears.